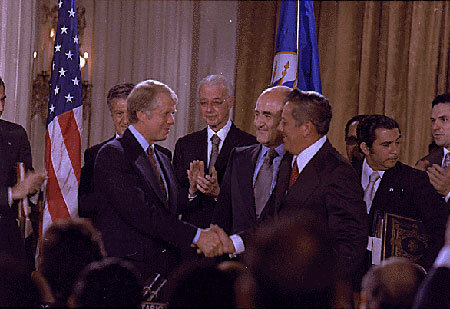 One of President Jimmy Carter’s greatest accomplishments was negotiating the Torrijos-Carter Treaties, which were ratified by the U.S. Senate in 1978. These treaties gave the nation of Panama eventual control of the Panama Canal. The United States acquired the rights to build and operate the Panama Canal during the first years of the 20th century. The Hay-Herrán Treaty, negotiated with the nation of Colombia in 1903, allowed the United States rights to the land surrounding the planned canal. The Colombian Senate refused to ratify the treaty, but Panama was in the process of seceding from Colombia. President Theodore Roosevelt therefore supported the cause of Panamanian independence with the Canal in mind. His support paid off, and on November 18, 1903, the United States signed the Hay-Bunau-Varilla Treaty, establishing permanent U.S. rights to a Panama Canal Zone that stretched across the isthmus. Phillippe-Jean Bunau-Varilla, the Panamanian representative, entered the negotiations without formal consent from the Panamanian government, and had not lived in Panama for seventeen years. The Canal opened in 1914, but many Panamanians questioned the validity of the treaty. As the 20th century progressed, tensions between the United States and Panama over U.S. control of the Canal grew. In 1964, a riot between U.S. residents and Panamanians, sparked over the right to fly the Panamanian flag in the Canal Zone, led to a brief interruption of diplomatic relations between the two countries. Within months, ties were re-established and both sides recognized the importance of negotiating a new agreement concerning the Canal. In 1967, the United States and Panama reached agreement on three treaties regarding the status of the Canal, however, Panamanian president Marco Robles was defeated by Arnulfo Arias Madrid in the 1968 Panamanian elections. Eleven days into Arias’s term, a coup led by Colonel Omar Torrijos deposed Arias and established a new government. Because of the political uncertainty, the negotiations suffered a major setback. Torrijos, like his predecessors, wished to reach an agreement with the United States. U.S. officials wanted a treaty as well. Secretary of State Henry Kissinger set forth his reasoning in a meeting with President Ford in 1975: “If these [Canal] negotiations fail, we will be beaten to death in every international forum and there will be riots all over Latin America.” In 1973, the Nixon administration appointed Ellsworth Bunker, a seasoned U.S. diplomat, to lead the U.S. delegation. Bunker focused on ensuring perpetual U.S. use of the Panama Canal, rather than perpetual U.S. control of the Panama Canal Zone. Between the years of 1973 and 1976, Bunker and his team were able to conclude a series of draft agreements with the government of Panama that formed the foundation of the eventual Torrijos-Carter Treaties. In the weeks after his electoral victory, President-elect Carter’s views on the Canal began to change. One of his closest advisors, Sol Linowitz, supported a treaty, as did Secretary of State-designate Cyrus Vance. The two men were able to convince Carter of the importance of a new treaty, and when he took office, Carter made concluding negotiations with Panama a priority and named Linowitz co-negotiator with Bunker. Despite the fact that both Carter and Torrijos were eager to conclude a treaty, many obstacles remained. A treaty must be ratified by the Senate with at least a two-thirds majority in order to take effect. Many Senators were opposed to giving Panama control over the Canal Zone. Most notable of these critics was Strom Thurmond (R–SC). Thurmond, who was born twelve years before the Canal was built, had a different perspective than the Carter administration. “The loss of this canal would contribute to the encirclement of the United States,” he stated in a 1978 debate. Thurmond and other conservatives also distrusted Torrijos, whom they considered to be pro-communist. Because of the strong opposition in the Senate, Carter’s consultations with Congress amounted to a second set of treaty negotiations. The Carter administration formulated a strategy to conclude debate over the Canal and to gain Senate ratification. Carter officials worked on selling the treaty to the public, holding hundreds of forums where policymakers explained the administration’s rationale for completing a treaty. Torrijos hosted U.S. Senators in Panama, where he stressed that he was neither an enemy of the United States nor a communist. Actor John Wayne, both a conservative and a friend of Torrijos, also endorsed the negotiations. The negotiators decided that their best chance for ratification was to submit two treaties to the U.S. Senate. The first, called The Treaty Concerning the Permanent Neutrality and Operation of the Panama Canal, or the Neutrality Treaty, stated that the United States could use its military to defend the Panama Canal against any threat to its neutrality, thus allowing perpetual U.S. usage of the Canal. The second, called The Panama Canal Treaty, stated that the Panama Canal Zone would cease to exist on October 1, 1979, and the Canal itself would be turned over to the Panamanians on December 31, 1999. These two treaties were signed on September 7, 1977. It took more than six months before the Senate voted. Many Senators who opposed the treaties tried to add amendments that would make it harder for other Senators to vote in favor of them. In the end, the Carter administration succeeded—but just barely. The Senate ratified the Neutrality Treaty on March 16, 1978 by a vote of 68 to 32. On April 18, they ratified The Panama Canal Treaty by an identical margin. The Carter administration revisited many of these issues with Congress when it negotiated the implementation legislation for the Torrijos-Carter Treaties. Carter signed the implementation legislation into law on September 27, 1979. The Torrijos-Carter Treaties allowed the United States to defend itself from charges of imperialism made by Soviet-aligned states. While the treaties represented a great moment of cooperation between the United States and Panama, relations between the two countries grew contentious after the death of Torrijos in 1981. In December of 1989, President George H.W. Bush ordered an invasion of Panama to remove Panamanian leader Manuel Noreiga from power. By 1999, however, relations had grown more peaceful and the Canal was turned over to the Panamanians who have administered it ever since.